The other day I pulled into a convenience store to meet someone, and look at a car they had for sale. 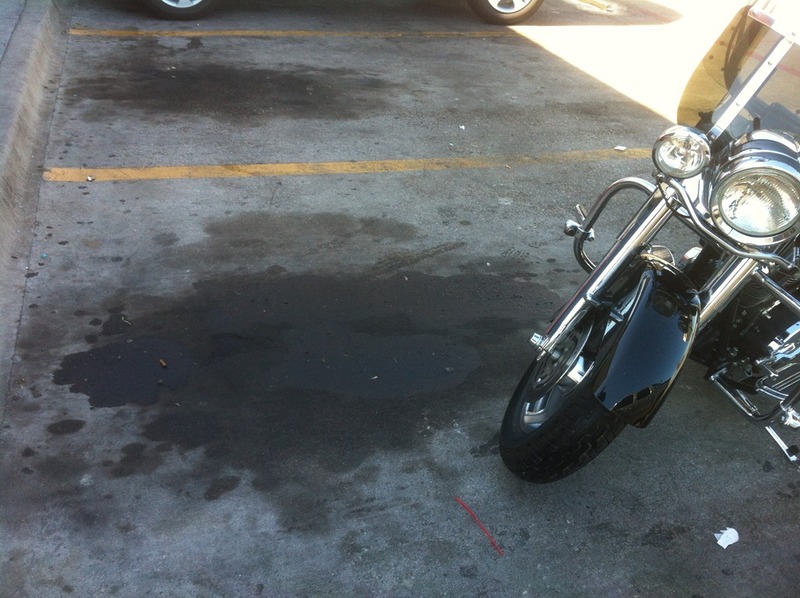 As I turned into the parking lot, looking for the car was on my mind, and without paying much attention, I just wheeled into a spot in front of the store – an oil spot that is! Okay, okay – I already know it was dumb and careless. So before you start calling me a dummy, I usually do pay closer attention to these kinds of things. Sometimes I guess our distracted thinking can get the better of us. That’s definitely not a good thing when we’re on two wheels. As soon as I realized what I had done, I backed my bike out of the spot where people’s cars had been hemorrhaging, apparently for ions, and moved it over a few inches. My front tire now had a nice coat of oil. I didn’t worry about wiping the oil off my tire, I just rode slowly and took the long way around the parking lot when I left so the slickiness would wear off before getting back on the road. I caught myself being very cautious though for the next several minutes. It would have been a good idea to grab a couple of paper towels from the clerk to give the tire a quick wipe down. Stoplights are another place where you can get into a heap-a-trouble with oil slicks. Turning lanes can be especially tricky. Running through oily patches just prior to, or in the midst of a turn can sure cause you some grief – even more so if the road’s a little damp. 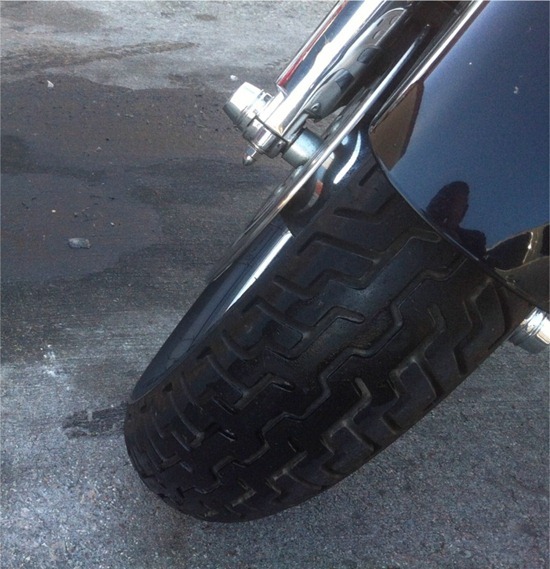 Speaking of damp roads – it’s always a good idea, and most bikers do this, to ride in one of the tire tracks when traveling down the road. Simply because the oil droppings from leaky automobiles are in the center of the lane. Now there may not be enough oil on the road to be of any real concern, in fact you may not even see any – but it’s there! And when you mix a little water from a rain shower with it, it’s slicker than snot. Hope this helps. Ride Safe & Happy Trails! Interesting article! One really dangerous place is at the toll booth. I lived in New York and rode my Harley daily. Other than the usual dirty streets and oily surfaces from all the cars, the worst of them all was the Toll booths. Its where every car and trucks stops to leave their dripping oil. Everytime I had to stop at a booth I usually slid right through the gate…not a pleasure. Oil from a jap bike is worse than from a car! It must be the fish oil they use! That wasn’t nice, Roger. Don’t you know that only Harley’s leak oil? Previous post: Makin’ It Fit! How to Stick a KLR 650 in a Square Hole. Next post: Cars Breeding Motorcycles? That’s Just Wrong!! !